Well, until now, Renault could claim that the Captur is the largest car in its segment as it is longer than the Creta. However, the Kicks has taken that title for itself now as it is the longest out of the three. In terms of width and wheelbase though, the Kicks and the Captur are tied while they both are wider than the Creta and have a longer wheelbase. The only aspect where the Creta comes at the top is the height as it is the tallest in the trio. The Creta has the least ground clearance as well. The Creta seems to serve both the ends of the power spectrum when it comes to diesel powertrains. It gets a 1.4-litre 89bhp motor and a 126bhp 1.6-litre version as well. However, as the Kicks and Captur only offer a single diesel powerplant option, the Creta seems to have the upper hand. Thanks to a significant power difference, the Creta's 1.6-litre motor shines with a superior torque figure as well. Another major benefit of the Creta is the fact that it also offers an automatic transmission option alongside a standard manual. 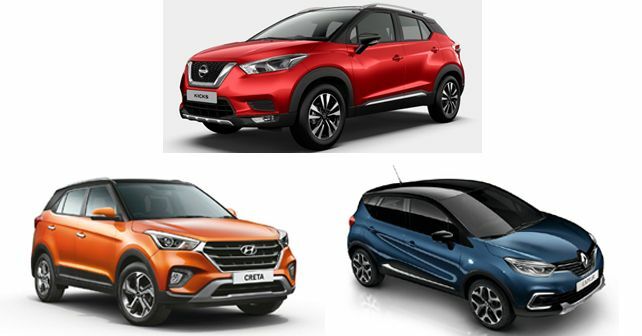 Seeing that a large chunk of Indian car buyers now prefers to opt for an automatic, this puts the Kicks and the Captur at a serious disadvantage. The top-spec variants of all the three cars offer a good amount of equipment. Modern-day basics like a touchscreen infotainment system, cruise control and leather upholstery can be found on all three. However, the Creta edges ahead thanks to the availability of convenience features like sunroof and wireless phone charging. Since the Kicks is the new one here, all the pressure was on Nissan to price it aggressively in order to give it a fighting chance. Having said that, the Nissan Kicks has been priced really well with a starting price comparable to that of the Creta. However, due to the presence of more features in its higher-spec variants, the Creta's price range goes up quite steeply. In that aspect, the Kicks offers better value for money as its lower variants also offer a good number of features and the top-version is significantly cheaper. The Captur offers a higher starting price range but, in the end, a top-spec Captur will be the cheapest among the three, albeit lesser bit of kit than its rivals.